Numerous studies have suggested that the guilty pleasures of chocolate may not be quite so guilty after all. Cacao beans and nibs, the raw materials for making chocolate, are high in flavonoids, contain more antioxidants than most fruits and appear to lower cholesterol in people with high cholesterol. In fact, the whole cacao fruit was used medicinally among the Maya, Olmec and Aztecs, and was spread from there to Europe after the Spanish conquest of those peoples. From the 16th through the 20th centuries, medical texts reported no less than 100 medicinal uses of cacao. Most commonly, the uses were to encourage weight gain, stimulate appetite, stimulate the nervous system and improve digestion and elimination. Of course, we know cacao as the source of chocolate, the decadently delicious, luxurious guilty pleasure. There are, however, some very good reasons that chocolate is a worldwide favorite food and flavoring, and scientists are discovering more of them every day. Among their discoveries: - Dark chocolate, which contains more cacao and less fats and sugars, can positively benefit the cholesterol profile - Cacao provides the same amount of antioxidant polyphenols as a glass of red wine - Cacao stimulates the production of natural antidepressants in the body, as well as containing its own stimulants, theophylline and caffeine- Cacao beans are rich in magnesium, calcium, iron, zinc, copper, manganese and potassium.They are also a good source of vitamins A, B1, B2, B3, C, E and pantothenic acid. Also known as: Theobroma cacao, Cocoa beans, Cocoa pods, and Cacao. Cacao stimulates the production of serotonin and endorphins, and contains phenylethylalamine and anandamide, two chemicals that elevate the mood and help increase focus. Cacao nibs contain a number of constituents that have been proven beneficial healthwise, but it's worth noting that many of these constituents are destroyed or lessened by processing. Health practitioners recommend that anyone interested in eating cacao for its health benefits use raw, unprocessed cacao beans and nibs rather than processed chocolate. 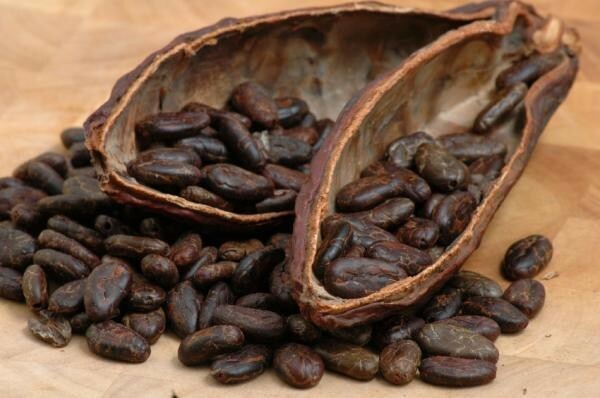 Anyone with a sensitivity to chocolate should avoid eating cacao beans or nibs. The active polyphenols and other substances in cacao can trigger migraines and cause other allergic reactions in sensitive people.